Bothell Country Village is a quirky outdoor mall in the Seattle suburbs where you can easily get lost wandering from store to store, especially if you like to browse antiques and handmade arts and crafts. You can get lost sketching, too! During a recent meetup of the Seattle Urban Sketchers group there, I was so overwhelmed with the drawing possibilities that I didn't know where to start. 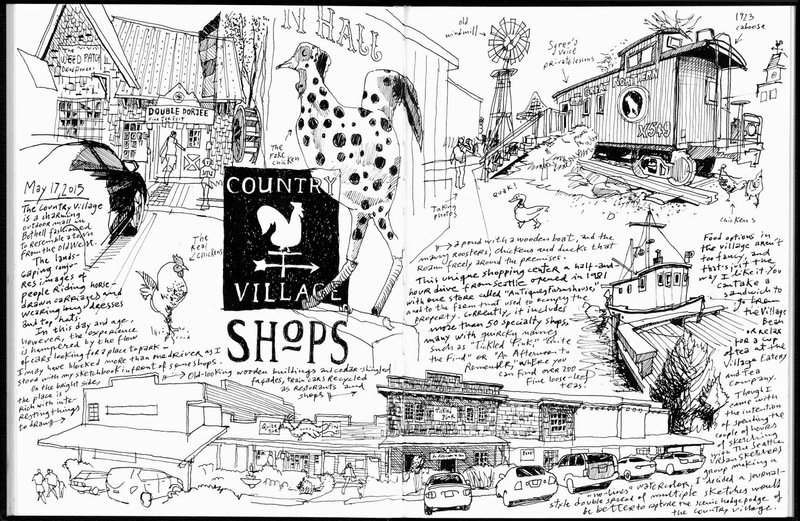 My original plan was to make a watercolor-only sketch similar to this one, but I ended up making random line drawings of whatever caught my eye: the big chicken sculpture at the entrance, the wooden boat by the pond, an old caboose, some charming storefronts and the big roosters that roam free around the village. It all came together in one sketchbook spread where I added some writing later. For different perspectives of this unique shopping center by my sketching colleagues, make sure to check the Seattle Urban Sketchers blog.